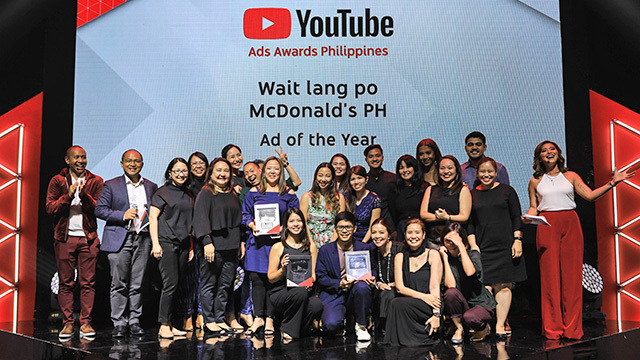 The inaugural YouTube Philippines Ads Awards recognized McDonald’s Father’s Day video Wait Lang Po as Ad of the Year. The video also won two top category awards or “Crystals” for Food and Beverage and Storytelling for Occasions. The one minute and 27 seconds-long video captured the patience of fathers as they watched over their children, from birth to adulthood. So what exactly made Wait Lang Po reign over hundreds of ads that were submitted for the awards? For McDonalds and creative agency partner Leo Burnett, their secret recipe is that beyond selling products, they sell relevant stories. “We always plan ahead, be ready with an idea,” said Christine Lao, marketing director of McDonald's Philippines. The advantage of having an ad in digital format is that they spend half of the normal TV budget and yet they can instantly see the reactions of people. “McDonald’s has always been investing on digital. We were doing online videos since 2011 so the challenge for us is to stay ahead. The pressure is on,” Lao said. Bea Coronel, assistant product manager of McDonald’s, said that it didn’t take them long to produce the video because they had a solid idea. “Everything we do starts with a consumer insight. So everything we do is grounded on a truth and we challenge our creative agency to come up with something. We like to keep things different, keep things fresh,” Coronel said. The YouTube Ads Awards sounded the call for entries at the start of 2018. They looked for digital ads published and marketed in YouTube that offered high-quality content, poignant and uplifting stories, and fresh advertising executions. Entries were then weighed by a panel of judges based on their content, effectiveness, engagement and business impact. From hundreds of video submissions, the awards panel produced a shortlist of 57 YouTube digital ads, which were then trimmed further and identified as Crystal, second prize and third prize awardees. The panel was made up of members from adobo Magazine, MullenLowe Philippines President and Chief Creative Officer Leigh Reyes, Co-Chair of Digital Measurement Board of the Philippines and Unilever Philippines Head of Media Dennis Perez, Vice President for Marketing and Distribution at Cebu Pacific Air Candice Iyog, Executive Creative Director at McCann Worldgroup Philippines Joe Dy, television host and three-time recipient of the Don Carlos Palanca Memorial Award for Literature Lourd de Veyra and singer, performer, and one of Philippines’ top YouTube creators Mikey Bustos. From the 57 shortlisted videos, 31 prizes were given to the best digital ads on YouTube. While McDonald’s took home the most number of Crystals, Globe and Jollibee brought home the most number of winnings, with five awards each. Their popular videos Because you can never have too many dog videos and Kwentong Jollibee Vow and Crush made it to the list. 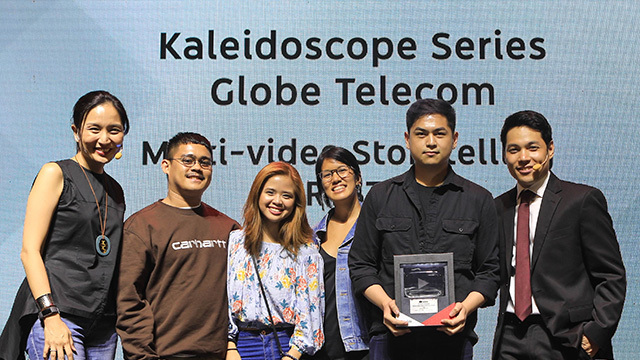 Two other Crystals went to Unilab’s Son, a story about a mom’s sacrifices, and Globe’s Kaleidoscope, a short video series on local artists. 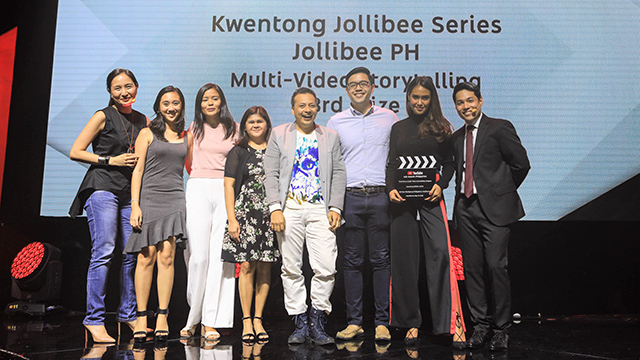 Google Philippines’ Country Marketing Manager Gabby Roxas said that the YouTube Ads Awards is a testament to Filipino creativity and imagination. “We’ve seen how digital advertising, in its many narratives and formats, can deeply engage audiences and give them a truly satisfying experience on platforms like YouTube,” Roxas said.